John is consulting director at MOSS ADAMS LL. He received his Ph.D.in economics with a focus on applied natural resource economics and natural resources law from the University of New Mexico. He has an extensive publication and presentation record that includes peer reviewed journals, trade journal publications, client project reports and assessments, formal business plans, energy and utility master plans, economic forecasts, and various other studies and investigations. Darryl Boyce is assistant vice president of facilities management and planning at Carleton University in Ottawa, Ontario, Canada. Darryl has served as a Vice-President on the ASHRAE Board of Directors and has also served as a director and regional chairman, region II and director-at-large. Darryl currently serves APPA as a member of the APPA Information and Research Committee, and is also the past chair of the Canadian Association of Universities Business Officers (CAUBO), national facilities management committee. Campus utility master planning must be understood as a process with a focused purpose that provides actionable strategies. Stated generally, the periodic self-analysis examines and documents existing utility systems, current needs, and the extent and timing of potential future needs. The scope of the planning process can vary widely. Indeed, a decision to undertake a utility master planning process must first identify both the purpose and specific product to be achieved. An advanced utility master plan can establish broad institutional goals to efficiently meet utility services requirements, address sustainability strategies, and provide a dynamic foundation for continuous reassessment and review of utility infrastructure life-cycle strategies in concert with comprehensive academic and facility planning objectives. The master planning process surveys information about the institution's utility systems and its service needs, organizes the information, documents conditions, develops strategies, articulates an action plan, and communicates this information to others. A good utility master plan is the institution's utility road map into the future. The utility master plan can (at a minimum) guide an institution's capital project investments. Without that road map, the potential problems ahead may not be recognized, and there is no assurance that efficient solutions will be identified. More important, however, is that without a plan formulated and vetted through a reliable process, prioritization of funding for and investment in utility infrastructure is much less likely to obtain necessary institutional commitment and support. In a justification similar to the support granted to key financial institutions by the United States government during the economic crisis of 2009 — recall that these institutions were deemed "too big to fail" — educational institutions will likely fund all utility services because the services are "too critical to lose." A campus utility master plan is, at its core, a formal business strategy and financial plan to address the mission-critical utility service requirements of institutional facilities. In many cases today, buildings are planned and even budgeted for construction without considering the central plant and/or utility infrastructure required to serve the building. Because a building must have electricity, heating, cooling, water and sewerage service to be usable, this is more than a little short-sighted. Sometimes, funding for new buildings simply fails to include the utility services necessary for the buildings. In other cases, the problems occur because of a gap between the visible buildings and an understanding of constraints on the more or less invisible support infrastructure. Even when it is determined that adequate capacity is not available, the buildings are sometimes built anyway. These circumstances may result in facilities built with low-first-cost, high-operation-cost incongruent systems that impose additional operational costs and workloads on an already overburdened operations staff. A utility master plan is the tool for planning and construction as well as facilities management. The facilities manager uses the plan in part to define utility and energy systems needs and the associated costs for the campus. This plan guides the efforts of the facilities management department in efficiently and effectively expanding and maintaining the energy and utilities systems. Ideally, utility planning is integrated into the fabric of comprehensive campus master planning and financial management strategies. The primary functionality of campus utility systems is dedicated to supporting campus services and programs, and as such should be structured and responsive to those needs and requirements. Sustainability goals must include provision of "adequate" utility services at minimum life-cycle costs. Indeed, without integration of planning for programmatic physical facilities and business strategies, it will be only coincidental that broad sustainability goals can be achieved — let alone realizing even a simple cost minimization objective for utility services. Every campus has some sort of a utility plan. If this plan is informal and understood only in the minds of several key individuals, the campus is exposed to generally unacceptable risks of both a physical and financial aspect. Communicating and vetting a utility plan requires the discipline and organization of committing the plan to writing. However, even the most carefully prepared plan does not assure its benefits can be realized — it must also be integrated with institutional planning decisions. Development, analysis, and comparative testing of alternative long-term utility systems strategies cannot be accomplished outside of a formal planning process. The lack of a well-documented, written plan makes the task of communicating the needs of the present or future virtually impossible. Importantly, increasing emphasis on climate change, energy-efficiency, and sustainability issues have broad impacts on campus planning generally, and utility master planning specifically. Emerging best practices are planning processes that proactively address developing energy- and facilities-related technologies in the context of traditional campus utility services. It is likely in this era that "life-cycle cost minimization" must also be explicitly balanced against other noneconomic goals in utility master planning, including “transitional” technology solutions and strategies. It is common to find that replacing a technologically obsolete energy services facility (e.g., campus steam plant) requires navigation of a host of competing technology solutions (i.e., natural gas boilers, combustion turbine combined heat and power systems, geothermal resources, solar thermal, etc.) reflecting widely divergent “maturity” characteristics for each alternative. A well-developed utility master plan serves as a defensible foundation for choosing the “most advantageous” solution. Furthermore, the plan can provide a wide scope of facilities management capabilities and serve to develop the senior support necessary to implement the dynamic business strategies required to achieve sustainable utility service goals. One of the primary reasons a utility master plan is necessary is to assess the capacity of existing utility systems, and to identify additional resource requirements to meet growing campus needs. Campus expansion is not just a matter of placing another building on campus. Buildings require heating, cooling, water, electrical service, gas, and storm and sanitary sewerage, as well as access for students, staff and service vehicles, fire protection, and maintenance. These factors need to be considered when first planning the siting of a building. Identifying and articulating how existing utility service capacity may be efficiently utilized, and prioritizing capital investment for additional capacity in a manner consistent with campus development plans defines a primary objective of utility master planning. The capability to serve additional facilities is not simply a location issue, and must also include capacity and service reliability assessments that can have profound impacts on the costs of utility service to both existing and new facilities. Advance planning will reduce the costs of providing services. Locating the building where service capacity is available, and prioritizing the availability of service capacity in areas where growth is likely to occur allows coordination of capital needs investments in the successful execution of multiyear capital planning — consistent with master campus development plans and responsive to programmatic needs. Many independent variables impact the siting of new buildings, and coordination of planning may assist in providing utility service capacity at substantial cost savings in both capital investments and long-term operating costs. The capability of the utility infrastructure to accommodate expansion must address variables such as the surplus capacity of the existing central plant, capabilities to integrate decentralized ("stand-alone") utility facilities, the location and capacity of utility services, the age and condition of the existing plant, and the cost and/or ease of adding additional capacity. To determine this, the utility master plan must first conduct a utility facilities condition assessment. Central and satellite plant capacity, distribution systems capabilities and constraints, options for capacity expansion, and the life-cycle costs of service alternatives must all be evaluated. This utilities infrastructure include electrical, heating, cooling, and domestic hot water systems; sanitary sewer; storm sewer; gas; and telephone and other communications systems. The methods of routing services (e.g., tunnel, utility corridor, duct bank, direct bury) are also key elements in planning. The facility condition assessment data is the foundation of the utility master plan and evaluates the ability of the system to accommodate existing and future loads. This process will pinpoint areas that need improvement to support the campus in the present and in the future. Timing is everything. That’s right. Which is why our sages tell us to repent exactly one day before we die. “But how do you know it’s the day before you die?” I asked. Another primary reason utility master planning is required is the need to anticipate the demands on the utility system so that the needed services are available when a new building comes online. Usually the central system capacity increases and utility services expansions do not occur in conjunction with the construction of a new building. Long-term strategic plans for central utility service expansions often size capacity investments to meet the needs of several buildings, and the timing of the additional capacity investment must anticipate useful life of existing equipment, reliability factors, capital constraints, and other timing issues. Anticipation of sector development over a 5- to 10-year planning horizon can save significant capital resources. For example, a new chiller or electric substation may have the capacity to serve many buildings, but the capacity must be available when needed for the first new building, leading to an excess capacity condition until the additional buildings are constructed. Also, because many specialized pieces of equipment in the central plant require long lead times to manufacture, the central plant expansion may require longer construction periods than that required for a new building. The master plan determines the magnitude of the needed central plant and utility expansion, when the expansion must occur, and the budget required for the expansion. Indeed, this is a classic case for ongoing capital needs assessments relating to utility master plans. A good utility master plan also evaluates the most cost-effective ways of meeting expansion needs. That said, evaluating "cost-effectiveness" is as much an economic art as engineering science when conducting long-term utility service planning. Engineers will routinely perform analyses on the costs and payback from capital equipment investments. In many cases, these are discrete analyses that compare the cost-effectiveness of individual components (e.g., cogeneration machine A to machine B). However, a central plant with many interdependent utility services forms a relatively complex economic system, with the life-cycle cost performance of the system dependent on configuration of interrelated systems and external variables (e.g., energy prices). 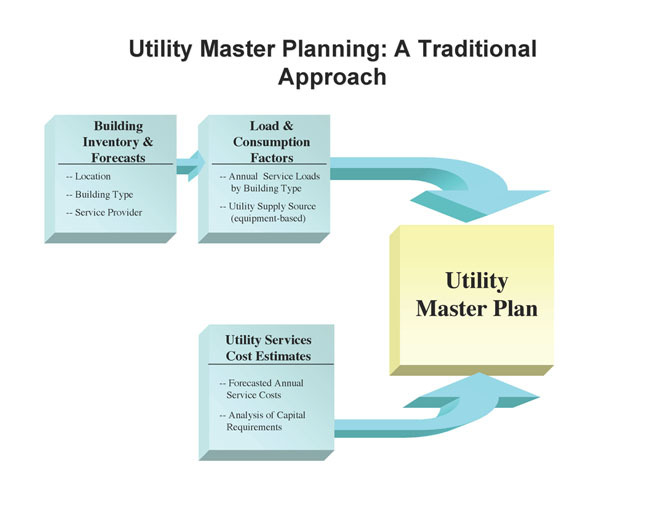 A utility master plan is dependent on understanding and documenting the performance of the utility systems and opportunities for energy use reduction in existing facilities. The sophistication of the utility plan turns on its ability to assess differing future operating conditions than can be observed from the existing systems. Assumptions regarding technology and service demand changes will dictate utility infrastructure sustainability strategies. Engineering performance models may be integrated with economic performance modeling to achieve more robust cost-effectiveness evaluations for utility master planning. Indeed, important capital investment decision capabilities are provided by a systems performance model that can evaluate the net present value of systems operations, including debt costs, major maintenance costs, capital replacement costs, and operating costs for alternative facility (investment) configurations, and under alternative growth and external factors (i.e., input prices, revenue sources, etc.). For example, the University of New Mexico undertook utility master planning to evaluate major extensions of its district energy system to a large tract of contiguous undeveloped real estate. Infrastructure planning preceded investment and was based on a comprehensive utility business plan model, incorporating both engineering and economic performance parameters to evaluate lowest net present value cost of serving existing facilities and an anticipated five million square feet of additional facilities over a 20-year period (nearly doubling total service requirements). Numerous alternative investment, growth, and input factor costs scenarios were evaluated. The planning produced a staggered schedule of service extensions, but surprisingly demonstrated that a second central plant could not be economically justified until at least the tenth year of the 20-year evaluation period. At Arizona State University, the staff thought a major expansion of the campus, combined with inadequate chilled water to the existing campus, would require major additional new chilled water mains. The master plan found that by increasing the chilled water temperature range (i.e., Δt), the capacity served by the existing mains could be doubled, and variable flow modifications could eliminate many of the circulation problems. Thus, the master plan process identified a cost-effective way of meeting capacity expansion needs. Without good utility master planning, utility expansion may not be sized properly for the added buildings; utilities may be added and/or installed without proper isolation valves and tees, manholes, or junction boxes located where future connections will be required. The mains may even be routed through a future building site, which will necessitate relocation when the future building is constructed. This is extremely wasteful of campus resources. It not only costs more to duplicate pipe runs or relocate mains, but it also disrupts campus operation and sometimes takes buildings out of service for an extended period of time. Although good utility master planning cannot entirely eliminate this problem, it can reduce it. A utility master plan performed in the context of capital asset management planning activities requires an inventory of physical assets and analyses of the condition of those assets. Such inventory should take explicit consideration of the risks associated with the failure of those capital assets, and a fiscal strategy to maintain or improve the condition of those assets. Risks may include (for example) environmental, safety and changes to development priorities for new facilities identified in the Master Plan for Campus development. Where technology changes rapidly (e.g., lighting efficiency), addressing risks and uncertainties as a formal sensitivity component of utility master planning may assist in identifying an efficient solution for meeting future utility service needs. A quantitative performance-model-based utility plan allows formal testing of assumptions regarding technology change, risks, and uncertainties. The performance model will not define the specific technology changes that will impact utility system decisions, but an ability to test the future impact on systems operations, capacity requirements, and costs can provide significant assurances. Decisions on budgets for facilities operations and expansion are usually political or bureaucratic rather than rational, or even based on good economics. Utility master planning processes that are sponsored by senior financial officers from inception have a significant leg-up in obtaining the required funding. Importantly, a master utility business plan that comprehensively assesses cash flow requirements to meet life-cycle operational, debt, and major maintenance costs can be indispensable to obtaining financial officers' and broader institutional support. Budgets and operations are often based on historic precedents, with adjustments based on economic trends and factors such as inflation. Budgets are sometimes based on square footage served or student full-time equivalents. All too often in higher education, short-term costs can drive financial decisions. Thus, lowest first cost, one-year operational costs, or similar considerations will often govern decisions, rather than life-cycle costs or long-range operational and maintenance costs. Similarly, the need to reduce current operating costs can lead to deferral of investments needed for renewal, modernization, and expansion to meet future capacity considerations. Given the long-term nature of most campus utility system investments, these systems can be particularly vulnerable to the adverse effects of short-term financial decisions. Effective capital asset management is a facilities' "best practice" and foundation for sustainability planning for utility services. Long-term capital needs assessments, based on comprehensive utility master plans, may assist in avoiding these pitfalls. A good utility master plan that lays out the long-term utility investment needs and a sound financial case for making these investments presented in a clear and convincing manner can do much to overcome this tendency. An overall campus master plan is generally the result of an integrated planning process. The principal goal of a college or university is to educate; thus, the planning process is driven by the academic master plan. Campus master planning is related to the buildings necessary to support the academic master plan. The utility master plan, in turn, supports both the campus and the academic master plans. All of these plans are related to financial planning, or what is usually called the budget. To succeed, all these master plans must be integrated and work together. The focus in this chapter is on the utility master plan, but it is important to keep in mind how the academic, campus, and utility master plans and budget relate to the overall campus master plan. Campus management philosophy and projections of facilities needs begin with the academic planning process. This process determines what academic programs will be taught and the type of research that will be conducted, as well as the number of students and the physical requirements (buildings, square footage, type of space, etc.). It is important that this planning be well developed and accurate to project the best possible information about campus growth and the needs for improvements or additions to the current buildings and systems. The facilities planning process provides feedback about the limitations of the plant's ability to supply the potential needs of an academic program and the costs of supporting the needed improvements. The Campus Master Plan guides the physical development needed to support the mission and strategic plan of an institution of higher education. The Campus Master Plan provides strategies for the development of various aspects of the physical environment- facilities, open spaces, housing, circulation, parking, etc.- to respond to the needs of the college or university. The Campus Master Plan for development can play a key role in this strategy development if it is structure to provide a longer term development strategy as well as energy use targets for the new facilities. Campus master planning and financial planning must work hand in hand to develop and implement the overall utility master plan. The financial planning process, however, must take into consideration many factors other than building costs and plant operating costs. Academic salaries, administrative costs, and funding methods are among a few of the financial considerations that affect or compete with plant improvement and operating costs. Economic risk factors (e.g., bond rates, inflation, input costs) must be incorporated into long-term financial planning. In addition to the number of dollars needed, the source of the money is a major consideration in financial planning. The utility master plan provides financial planners with the information they need on the costs of energy, operations, and maintenance. 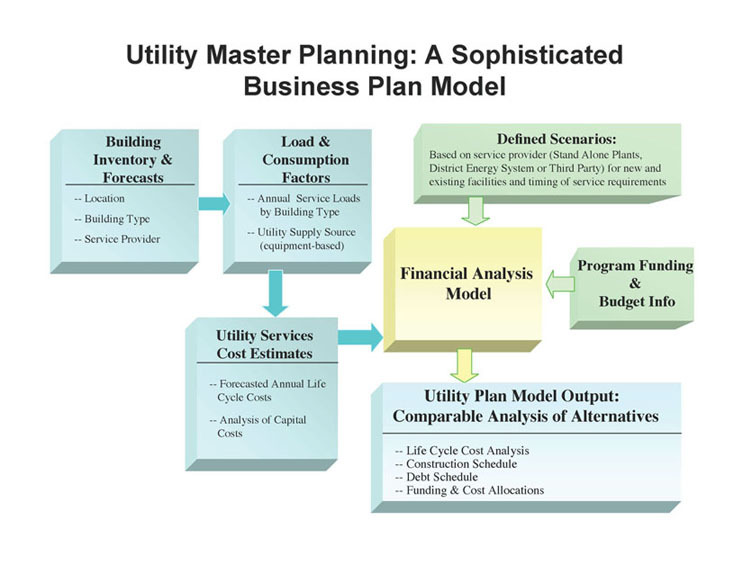 An advanced utility master plan that incorporates a comprehensive business plan component can provide the specific data required to support the budget process. The information includes purchased energy, central plant operation costs, debt costs, distribution, and general building custodial operations and maintenance. Energy-using systems are often a major part of building operational costs. Utility master planning processes that are sponsored by senior financial officers from inception have a significant leg-up in obtaining the required funding. Importantly, a master utility business plan that comprehensively assesses cash flow requirements to meet life-cycle operational, debt, and major maintenance costs can be indispensable to obtaining financial officers' and broader institutional support. A campus utility master plan, closely coordinated with the overall campus master plan, provides the campus with the planning information, including costs, needed to set aside money for expanding services to new buildings in the future, as well as to meet day-to-day or year-to-year needs. Capital needs assessments and planning can help to meet fiscal sustainability goals and ensure that the utility services are available when they are needed. The information about the expansion strategies and associated costs will allow the institution to understand the total cost of adding new facilities. By providing documentation and justification for the needed future expenditures, the plan helps ensure that the necessary funds will be available when capacity and operational requirements are demanded. 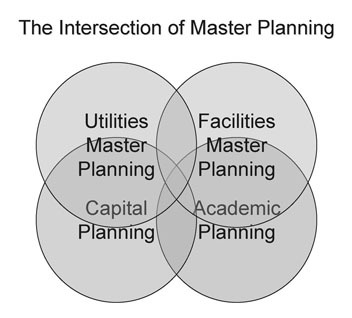 The following diagram illustrates the overlapping and intersection of campus master planning activities. A utility master plan as discussed above contains many integrated elements that work together to enable managers to establish a plan of operation. By approaching master planning as a series of related steps or building blocks while keeping the big picture in mind, the process becomes much more manageable. Determine what exists or what is available. Determine what is currently needed. Determine what will be needed in the future. Determine when the need will occur. Determine what needs will or will not be met. Determine ways in which items that are lacking can be provided. Determine feasibility, construction cost, and operation and maintenance costs of potential solutions. Evaluate and determine the best options. Determine how the best option can be improved. Determine the best strategy to implement the best option. Develop and document a timetable and budget for the recommended actions. An example of an asset that is not readily apparent is the deep cold waters of Cayuga Lake near Cornell University. Lake Source Cooling is one of the most significant environmental initiatives ever undertaken by an American university to promote a sustainable future. With its startup in July 2000, Lake Source Cooling (LSC) upgraded the central campus chilled water system to a more environmentally sound design that conserves energy and utilizes a renewable resource. With a price tag of $58.5 million, a higher cost than simply replacing the existing chillers with new ones, LSC was a significant project. However, it provides the university with a method of cooling that eliminates refrigeration equipment and its associated energy use, impacts on the environment from energy use, and any future problems with the new generation of refrigerants that have been designed to replace CFC's. The Pennsylvania State University (University Park campus) central steam plant (circa 1930) is located near the congested heart of the campus with difficult access issues. The coal-fired plant must truck coal in and ash out of the congested campus location daily (i.e., 15 to 21 coal trucks (23 ton) per day), providing a specific liability that must be addressed in the master plan. Additional steam capacity was added in 1972 (and subsequently upgraded) with a gas-fired cogeneration plant now connected to the steam system at a more favorable site removed from the core of the campus. However, recent decisions taken to convert the steam plant to natural gas have been met with disrupting opposition, with challenges ranging from the specific location of a required natural gas line and the selection of the fossil fuel technology (in preference to renewable resources) impeding the deployment of otherwise favorable improvements in the existing assets. A key element of an energy or utility master plan is the analysis of campus energy use records. These records reveal how much and what type of energy is being used and, in some cases, where the energy is used. Comparing the university's energy records with those of other like institutions is a useful tool in establishing the potential for energy use reduction savings. For example, a comparison of Sacramento State to Fresno State showed that Fresno State, which is the same size as Sacramento State, has the same building construction type and use, and is in the same general climate — but used twice the energy as the Sacramento State facilities. The increased energy use was primarily in the summer. Electricity and gas usage per square foot was approximately the same for both universities in the winter. In the summer, both universities used about the same electrical energy, but Fresno State used more gas. The reason for this difference was determined and addressed in the utility master plan. The single-stage absorption chillers used by Fresno State required large amounts of gas in the summer. The chillers also required the operation of a large steam plant and a distribution steam system, with attendant energy losses. The oversized cooling tower, the condenser pumps, and the inefficient arrangement used as much electricity as a conventional electricity-driven chiller plant. This conclusion was confirmed after the campus was modified to use electric chillers and thermal storage. Adjusted for square footage, the campus currently uses less electrical energy in the summer than previously, and gas use is dramatically reduced. The large central steam plant is shut down in the summer. Other valuable planning information, not so easily obtainable, is peak load and energy time-of-use consumption patterns. Emerging advanced metering and smart grid energy management strategies implement fundamental dependencies on enhanced information technologies and data resources. Coupled with advanced energy management software, these resources are revolutionizing energy efficiency and cost management capabilities for facilities professionals. Where advanced metering is not installed, this information sometimes is available from the electrical utility for electrical energy, but similar information for other types of energy usually is not available. Facilities management strategies are increasingly dependent on information about how the energy is used on campus. It is necessary to know the energy use of individual buildings, each building's energy use pattern, and the transport energy required to support the buildings. The potential for significant economic benefit in both facility management and utility service planning is likely to demand increased investments in these metering and monitoring systems. Indeed, many institutional facility managers have implemented and are relying on some form of “dashboard” to accumulate this data in a usable form for facility performance monitoring. These capabilities will only expand in future applications. As a basis for utility master planning, it is necessary to determine future loads from the predicted types, sizes, and uses of buildings. The location of these future loads must be estimated and a schedule for probable expansion developed. This is the basis for determining future expansion needs. By comparing the capability of the present production and delivery system in the area of new construction with the expanded need, the need for capacity increase or other modifications can be determined. Based on the projections of campus growth from the overall campus master plan, the utility master plan provides the needed guidance for expanding the energy and utility systems. The need for new buildings, their locations, construction type, and probable time of construction is determined from the academic and campus master plans. Such plans should also incorporate the needs for remodeling and the program changes that will have an impact on the utility systems. Replacement and expansion needs for the central energy plant and utility distribution systems result from the analysis of those requirements and the evaluation of the current utility systems. The design concepts are identified, the approximate size of equipment is selected, the location of expansions or modifications is defined, and the costs are estimated for planning purposes. When planning for new or extended systems, campus utility installations should be flexible enough to respond to changing energy costs, service availability, technology advancement, and expansion needs. At the same time, budgetary constraints seldom allow large expenditures far in advance of future growth. These challenges require significant thought and input from the most knowledgeable utility people available. This is often addressed as a part of the "self-evaluation" that is the foundation of good utility planning. Timing of expenditures for the needed expansion is a critical component of utility master planning. The master plan must take into account the unusually long lead times typical for some components in central plants. Also, access to the campus is a key element in timing. It is necessary to schedule some work for low-activity or favorable weather periods such as summer. If it is necessary to suspend service to a building or the campus, there may be only certain limited times that such suspension is possible, and therefore significant advance planning and coordination are necessary. Moreover, avoiding multiple, independent construction projects by effective planning can provide substantial capital cost savings. The utility master plan should look at a variety of ways to meet needs. Often, campus needs can be met in several ways. Identifying these potential ways and evaluating them in a way that takes into account all the variables, including the uncertain developments of the future, is a significant challenge. When this challenge is met well, the master plan has served its purpose. One typical evaluation common in university master planning, is a comparison of the relative merits of stand-alone, or local site solutions, with service from a central campus system. Although the simple economics of first cost, energy costs, and operation costs can be compared in a reasonably straightforward way, some variables are more difficult to identify, and their value is similarly difficult to quantify. Examples include, "What will be done when the original equipment wears out?" University buildings typically last 100 years or more, and mechanical and electrical equipment is often totally worn out in 20 years. Europe, with its longer history, demonstrates that we should think in terms of centuries. Yet time after time, we see equipment buried in buildings where reasonable service or replacement is impossible. In many cases, this is due to inadequate planning at the time of installation. In other cases, it is due to additions, remodeling, or construction of other buildings that eliminated access. The centrifugal chillers at the Los Angeles Times, which were installed in 1933, have remained in use not because replacement was imprudent, but because the limited planning done at the time of their installation did not allow for actual developments and therefore did not provide a way for them to be replaced. The implementation of sustainability concepts in utility master planning has the potential to fundamentally restructure the process and questions addressed in the evaluation of utility service alternatives. Energy conservation strategies may decrease required service growth, or even eliminate costly facility additions that would otherwise be "inevitable" without explicit consideration of these alternative strategies. In short, sustainability concepts in utility master planning create a new array of alternatives that must be considered. The University of California – Davis sought to develop a “zero net energy” student housing project, and initiated the $300 million West Village Campus project in 2011. The project was largely developed with private financing, but had significant financial support from both UC Davis and the California Energy Commission. One year into its operation, the project achieved its projected energy production goals. However, the project discovered it underestimated the per capita energy service requirements and is only able to achieve about 87 percent self-sufficiency with respect to the new systems’ electricity production. In short, energy conservation incentives did not extend to implementing pricing mechanisms that encourage residents to limit usage. It is clear that the project has a purpose to not just house students, but also attract them by providing amenities such as gyms, swimming pools, business center resources and other energy hungry resources. Meanwhile, the university also has sustainability goals that may conflict with the lifestyles of the student residents of the housing project. In this case an efficient energy systems project must be evaluated against diverse goals, beyond simple economic and efficiency criteria. Additional capital investment may achieve the “zero net energy” goal, but net economic benefit may be further sacrificed. Other elements to be considered in a utility master plan are the available energy sources, their costs, and the cost of the systems to use them. Because of variables, this is not always a simple process. A utility master plan for a California university found that an electric chiller plant expansion would have lower energy costs than a steam-driven plant, but the cost of additional power to the central plant would result in a more costly installation. An independent utility study of the same problem obtained different results, for a variety of reasons. Some of the reasons are worth consideration: The original master plan was based on 2,000-ton expansion increments without considering optional sizes or identifying a reason for the specific size selection. The original master plan comparison listed electric drive as a selected option with higher first cost and lower energy cost. Although the cost estimate for this alternative was not included in the report, the higher first cost appeared to be a result of a simple evaluation of the cost of an electric-drive chiller plus electric service compared with the cost of a steam-drive chiller. It did not appear to include adjustments for cooling tower size, condenser pump and piping, elimination of the surface condenser, and the steam and condensate piping. The original comparison evaluated only the chiller energy and not the entire chiller plant, which included cooling towers, condenser pumps, and variables. The electric plant used less energy for these purposes. Combining thermal storage and modifications to pumping resulted in lower on-peak electric energy consumption than the alternative steam-drive solution. The alternative of using steam to offset electric service expansion was considered in the original report as being feasible only until expansion used the available cooling tower capacity. The electric company was interested in providing the expanded power as well as other incentives in order to sell electricity. The evaluation was based on a size that required both steam- and electric-drive chillers to be open-drive. Slightly smaller semi-hermetic chillers are available at about half the cost per ton of open-drive chillers. Of course, this lower cost option applies only to electric-drive options. The existing old steam-drive chillers, which the original study recommended for replacement, had condenser piping and cooling towers that were in good condition. The existing cooling towers could each serve a 1,500-ton chiller but were not big enough for the 2,000-ton chillers, and the incremental cost was not considered. Thus, the decision to limit evaluation to 2,000-ton chillers created a major cost for cooling towers that would not have been needed had slightly smaller chillers or electric-drive chillers been used. The most effective solutions in a university utilize the principle of synergy. That is, the systems combine together to make a solution that is better than the sum of the parts. Examples include thermal storage, heat recovery chillers, strainer cycles, cogeneration, energy reduction programs, and variable volume systems. The element to look for in a utility master plan is how to develop the best integrated energy solution for the specific campus. Often this is a unique integration that will not be found on any other campus. The best integration cannot be determined by "cookbook" engineering, even though the solutions that work on one campus often will work on others. Systems integration actually means using each energy source to its best advantage. For example, central plants that are designed to recover heat use the same chiller energy for both heating and cooling. In fact, the part of the heating energy that is used reduces the requirement of the cooling towers to dispose of heat. Cogeneration can also be part of an integrated system. The purchased fossil fuel energy can be used to generate power, heat buildings, accomplish process heating, and possibly provide energy for an absorption chiller. In implementing cogeneration, additional considerations relating to achieving energy efficiency and carbon reduction goals may also motivate such investments. Integration is more than engineering, but also involves an economic evaluation. To illustrate this, consider a recent evaluation of two alternative cogen machines — Unit A with a lower installed cost and lower heat rate (i.e., greater energy output per unit of energy input) versus Unit B with greater installed cost and higher heat rate (i.e., less thermal efficiency). A stand-alone engineering analysis recommended Unit A, but an integrated economic analysis preferred Unit B. The difference — Unit A required much greater boiler steam production, and Unit B more fully met campus steam requirements per unit of fuel burned by the cogen. The integrated economic analysis considered the net system efficiency, rather than the simple engineering efficiency of the alternative cogen units. Another excellent opportunity is integration of chilled water and fire protection. The large mains that are required for chilled water also can be used for fire protection by connecting building fire sprinklers and fire hydrants to the chilled water system. This is particularly attractive when a large chilled water storage tank is part of the cooling system. In that case, the storage tank, if properly located, can also serve as a fire protection storage tank, adding to the available city or campus water. Integrated solutions strive to use the assets of the campus to best advantage. The goal is to give the best long-range plan, considering cost, reliability, and flexibility. Keeping in mind (1) the available energy sources and (2) the fact that integrated solutions provide the best utilization of the energy, a number of options should be considered. Some of the combinations that have formed viable energy options for various projects are presented here. Chillers, usually electric drive, can be designed to make the rejected heat that is normally sent to the cooling towers available for space heating on campus. Cooling energy from overheated spaces is made available to other spaces on campus that need heat. This greatly improves the heating and cooling efficiency of the campus energy system. When energy was cheap, boiler designers allowed 20 to 25 percent of the purchased fossil fuel energy to be wasted in the form of hot stack gases expelled to the atmosphere. Currently, there are devices on the market that can recover half of this energy, and more in some cases. The recovered heat can be used for heating domestic water, for process heating, or for space heating. The recovered energy allows elimination of a separate heating process that was probably either inefficient or expensive. Thermal storage allows a form of energy to be generated at one time and used at a different time. For example, one campus in northern California was designed with chilled water storage. The required cooling capacity was 2,000 tons. By increasing chilled water storage, only 1,000 tons of chiller capacity was installed. This reduced the overall capital costs, reduced electrical demand charges, allowed a time-of-day electrical rate break, and reduced energy use because chilling was done at night, when cooling towers perform better. Many electric utilities have offered financial incentives through their demand-side management programs in the past. In many situations, the incorporation of thermal energy storage not only reduces the need for more chillers but also lowers the cost of generating chilled water. Solar technologies are emerging as a significant energy production resource, with substantial improvement in the cost-effectiveness of these systems. Ranging from passive facility design and construction methods to active photovoltaic and concentrating solar-thermal resources, solar energy technologies are providing significant opportunities to meet renewable and sustainability goals of campuses as these technologies mature. The cost competitiveness of these systems is improving, but other noneconomic motivations will also lead to inclusion of solar energy strategies in campus utility systems. Geothermal energy does not have to mean 300°F. Well water as low as 50°F can be used as an energy source for a heat pump. Obviously, the warmer the water source, the less supplemental energy will be required to make it useful heating energy. The 180°F water at Oregon Technical Institute in Klamath Falls, Oregon, is a major asset, but a geothermal asset of almost any temperature should be considered in a utility master plan. Where 100 percent outside air is used, heat exchange with groundwater can temper the air. When groundwater is not hot enough to supply direct heat, a small amount of energy can raise the temperature of the water to one that is usable. Cold geothermal sources (i.e., groundwater below normal air conditioning temperatures) should be considered for direct cooling or precooling. By using a heat exchanger to cool returning chilled water, the load on chillers can be significantly reduced, and for parts of the year, it may not be necessary to run the chillers at all. Biomass and solid waste will likely become significant sources of energy because the conversion to energy process eliminates the purchase of new energy while performing the necessary task of processing solid waste. Air pollution controls and ash disposal are key concerns to be solved in the future. In Springfield, Oregon, there are three industrial plants, each with enough waste heat to heat all of the large commercial customers in the city. The main reason this is not being done is that the commercial customers are spread over a wide area, making collection and distribution economically impossible. A campus has the advantage of a dense heat need and, in many cases, an existing central distribution system. Industrial waste heat is an excellent option for consideration in a campus utility master plan when available. Cooling with the use of cool geothermal water was discussed above. The use of cooling towers or any other cooling source to avoid the use of chillers should be explored in a utility master plan. Professional prognosticators are able to predict two things with certainty: change will occur, and their specific predictions of future events, economic conditions, and the pace of change will be wrong. A campus utility master plan must consider the effects of changing conditions and provide some guidance for responding to changing conditions. One of the challenges in utility planning is knowing the changing conditions in energy sources and energy delivery systems. The trajectory of energy price increases will dictate many components of change, including technology innovation and availability of specific fuels. Facilities managers must recognize that over a reasonably short period, in terms of the campus building's life, the energy availability and cost picture may change dramatically. Alternative energy technologies such as photovoltaic systems, "negawatt" investments, biofuels, hydrogen fuel, tidal energy, wind, and geothermal resources will all play a part in energy planning for the future. With such uncertainties, formal "technology risk" analyses can be incorporated in utility master planning, and can be balanced against other requirements and goals (e.g., reliability considerations). The primary element in utility master planning is to acknowledge that change will occur, evaluate and plan for the potential solutions, and address the specific ability to meet change. History tells us that short-term energy costs can go up or down. It is also clear that the real cost of energy has not increased nearly as fast as the general rate of inflation over the past three decades. In the context of utility master planning, anticipating the future cost of energy is important, and the ability to incorporate energy price risk analysis in plans becomes increasingly significant to defining sustainable strategies. Plans must take into consideration the probability that costs will change, and this change will not occur across the board. In some regions, some energy supplies will experience much more rapid price escalation than others. Requirements for the modernization of the electric transmission and distribution systems will require significant capital investment in the next several decades. Oil and natural gas are being extracted from unconventional resources, with the development of those resources dependent on expectations as to future price levels as much as the pace of technological innovations. Energy costs dynamics must also consider the role of incentives, and the “life cycle” of inducements to implement specific technologies. Renewable energy production incentives provided by “net metering” strategies provide a clear example. In an effort to stimulate solar investments, utility regulators in many jurisdictions adopted a full retail price compensation for solar electric production. Utilities have countered with arguments demonstrating that the cost of providing backup to the intermittent solar resources are significant, and a full retail price net metering scheme burdens other customers with additional costs imposed by the solar generation resources. Importantly, the capital investment for the solar resources are frequently evaluated on the basis of net metering savings, ignoring the possibility (likelihood) of modifications to the regulated economic cost profile of the solar electric production facilities. The best campus energy solutions should provide strategies for shifting with the current energy economics and other metrics (e.g., conservation, carbon reduction, and renewable energy strategies). The solution proposed may be shown to be efficient enough that the economics will not reverse within the range of reasonable energy price expectations. However, if a certain solution has the advantage of a fast payback and can be replaced in the future with another solution, then the university will be less reliant on the long-term economic possibilities. The stability of supply of any fuel type used or recommended should be studied. If it is determined there is a likelihood that a fuel type will become unavailable (at an acceptable cost, or due to environmental constraints), a backup fuel system should be provided. Strategies to allow for fuel switching or to implement changes in fuel requirements of energy technologies employed (e.g., at the end of energy systems' useful life) may define complex master plans for required utility services. Transitioning for existing technologies may allow implementation of preferred long-term strategies, but will require a commitment, discipline, and frequent reevaluation of such planning decisions. As energy production facilities requirements grow on a campus, system redundancy and backup (e.g., "N-1" systems engineering principles) may create opportunities to introduce new energy production technologies more gradually. Campus buildings are regularly evolving to meet the needs of the institution, which may involve changes in occupancy and use. At the same time the indoor environmental standards and guidelines are also evolving.. The American Society of Heating, Refrigeration, and Air Conditioning Engineers (ASHRAE) Develops and maintains the primary standards for the indoor environment, Standard 62.1 which specifies the minimum ventilation rates and other measures to provide indoor air quality that is acceptable to the building occupants and minimizes adverse health effect. In addition, a building or room may be changed from a classroom to a laboratory, which may require that the percentage of outside air supplied to the space be significantly increased. The location of a central plant can have a large impact on the cost of operation, the plant's ability to deliver services to new buildings, and the cost of expansion. The location of the central plant should be carefully examined with an eye toward its impact on future growth of the campus. Master plans must recognize that distance, in addition to carrying a first-cost penalty, also carries an operation-cost penalty that will be paid over the life of the campus. A location central to loads, and yet accessible, is a major asset to a university. An elevated central plant location on a hilly campus can have a major impact on some equipment and some potential solutions. The location of the central plant must be integrated into the growth plans of the campus. Logical campus development and academic access to the buildings should come first. Next, the visual impact on the campus should be considered. The central plant should be located where it can serve the campus and campus expansion without interfering with access to the academic buildings and while fitting into the campus architecture. Many details must be considered, such as smoke, cooling tower plume, and prevailing wind relationship to building air intakes. Noise and effects of vibration on sensitive areas or equipment (e.g., electron microscopes) are also considerations. Each of these points deserves careful attention. For instance, the University of Arizona has found that establishment of a new central energy plant between two campuses that were growing together appears to work well with respect to each of the above items except proximity to loads presently served. On the other hand, as expansion takes place, the proximity issue will become very positive. The problem of the impact of location on maintenance and operation labor cost will be addressed by remote operation of a chillers-only plant at the new location until the entire central plant is moved sometime in the future. Similarly, utility master planning may produce a long-term plan that stages the implementation of new central plant infrastructure as loads and service requirements increase consistent with the facilities master planning for the campus. When planning for a central energy system, several major variables have a large impact on the system. Several are discussed in this section. During the planning process on a specific campus, other factors unique to that campus will have a major influence on the plan. The planner must keep a watchful eye for these. In some cases, a highly efficient system can use a more expensive energy source and still be more cost-effective. In other cases, the cost of operation is not the key issue because of other factors. In some instances, the disposal of infectious or hazardous waste is the real reason for operation of waste heat recovery incinerators, and energy is a secondary issue. At other times, cogeneration is installed to increase plant reliability and performance in emergency conditions, and this is the justification for increased first cost. Energy cost and efficiency must be considered for present and projected conditions. The sensitivity of planned central plants to energy costs should be examined, and the ability of the system to maintain its efficiency should be evaluated. Some systems lose efficiency over time or with poor maintenance. For example, currently available photovoltaic systems are (generally) anticipated to lose efficiency through time, but such loss of efficiency may be factored into the economic analysis of these systems with the additional expectation of relatively rapid increases in total systems efficiency, allowing for cyclical technology replacement that will increase total systems efficiency over time. Maintenance costs for existing and proposed energy systems must be carefully considered during master planning. Some equipment requires specialized maintenance, some requires more maintenance than an alternative, and in some cases the cost of replacement parts is high. The true life-cycle cost of an energy system must take into consideration the labor and other maintenance costs associated with each system. For example, high-pressure boiler plants have a high cost in terms of required attendance, regardless of fuel cost issues. Sometimes solutions that are less desirable for other reasons are advisable to eliminate this need. The entire cost of converting a central plant system may not stop with costs at the central plant and for the distribution system. For example, if a campus is converting from steam or high-temperature heating water to low-temperature heating water, it may be necessary to change piping and coils within the buildings. In such cases, it is common to find that some buildings require little or no conversion because the coils were oversized initially. Other buildings, however, may have steam or water coils that are too small for the change in technology. In either case, the coil must be changed to use the lower temperature heating water. Note that with thicker heating coils, the air-side pressure drop may also increase enough to cause the air system to be unable to deliver the necessary energy to the space. This requires speeding up or changing the fan. A common problem at the building interface is the way the building connects to the campus main piping. In some cases, this is done with bypass check valves or three-way control valves that cause bypassing of chilled water. This reduces the temperature change or energy effectiveness of the heating or chilled water systems through dilution and causes short-circuiting. Short-circuiting at buildings near the plant does not allow the necessary flow to reach buildings farther from the central plant. A thorough knowledge of the size and capacity of each existing system is a mandatory starting point for the planning process. This information may indicate, for example, that certain points in a distribution system are critical, yet most of the system has excess capacity that can be used to serve campus expansion. Often the true capacity of the delivery system can be determined only by extensive computer modeling or by "stress testing" the system under extreme conditions. Each major energy system on a campus has a diversity factor. This means that the peak campus load is almost always less than the total of all the building peak loads. For example, even though the sum of the peak electrical loads on campus equals 5 megawatts (MW), the maximum electrical demand may never exceed 3.5 MW. One MW can provide normal power requirements for 500 homes. This is because not all of the loads are ever at maximum at the same time. The same concept applies to heating and cooling energy. The diversity factor allows the systems to be sized slightly smaller than the sum of the calculated peak loads. Calculation of the diversity factor is sometimes difficult. A good way to determine the diversity factor if calculations are available is to compare the sum of calculated peak loads for existing buildings against measured peak consumption. If future expansion will involve a similar mix of buildings, the diversity factor calculated in this way should be reasonably accurate. An alternative method of calculating diversity is to use a computer model of the entire campus. This is an excellent approach but is seldom done. Typically, engineers use experience factors such as assuming that the campus cooling diversity is 20 percent, and from that assumption reducing the central plant size. These assumptions are usually conservative, which leads to their continued use. The load profile is the measured load as it varies throughout a day, a week, a month, or a year. This information is necessary to properly predict the overall performance of an energy system. Boilers, for instance, are less efficient at part load than at full load. This is also the case with most chillers. By determining a load profile, an engineer can estimate the number of units that will be operating and their load at any given time. Load profile prediction allows calculation of an overall average efficiency, which is more meaningful than a peak efficiency value under "test stand" conditions. Thermal water systems are designed with a difference between the supply temperature and the return temperature. The greater the difference (Δ), the more capacity that can be delivered for a volume of water. Currently good designers attempt to develop high ΔT to reduce pumping energy and the necessary pipe size. Good systems do not circulate any more water than is needed to meet campus loads. These variable-flow systems provide a reasonably constant ΔT. Steam pressure is usually designed using only a gross approximation of the steam pressure actually required. The higher the steam pressure, the greater the heat delivery per pound of steam and the greater the distance heat can be conveyed. Typically there is little correlation among design, operation, and need. Usually steam systems are either <15 psi or 100-150 psi. These higher pressure systems are usually attended (i.e., they require the presence of a plant operator), and the pressure is reduced at buildings. Design and operation of steam systems (or high-pressure water systems) at temperatures greater than are needed results in significant energy waste and often increased labor requirement. A good utility master plan attempts to determine what is actually required and the extent of the requirement. Operating a central boiler plant at high pressure in the summer to serve an isolated steam still or sterilizer is not a good solution. In some cases, it is economical to operate the boilers at high pressure and reduce the steam pressure through a small turbine to generate electrical energy using only the energy difference between the pressure of the steam generated and the actual steam pressure required for service to the buildings. Observation of the operation of water delivery systems is an excellent clue to campus systems. Many campuses use what is thought to be a constant-flow system. For these, typically the difference (Δ) between supply water temperature and return water temperature indicates the amount of useful cooling or heating that is being accomplished. A low ΔT indicates either a low cooling load or a cooling water bypass. In either of these two cases, little cooling is being accomplished for the water circulation. If there is little load, this wastes distribution energy, but if there is a large load and bypassing is taking place, then heating or cooling capacity is being wasted. At the same time, service may not be provided to other buildings. Information on heating and cooling ΔT is necessary to evaluate the effectiveness of an existing system and the possibility of increasing its capacity. Low ΔT also indicates where remedial measures are needed. Flow rates are also necessary to give the entire picture. Pressure problems in water heating or cooling (hydronic) systems can be the cause of low ΔT problems. Excessive pressure difference between supply and return water can cause control valves to be forced open. This can create both control problems and low ΔT. If pressure differences are high, the first approach is to determine whether such differences are necessary. If they are, pressure controllers will probably be required at nearby or low-elevation buildings. Good campus systems use variable-flow pumps that are controlled to maintain the ideal pressure difference in the campus piping. Projections of availability and price are necessary for every energy source that is in contention for use on a campus. This information is incorporated into long-range planning. Energy sources with questionable future availability should be avoided. Where pricing is uncertain, it is wise to consider designing flexibility into the energy plans for the campus. Indeed, explicit energy market risk analysis is a useful tool for implementation of robust utility master planning. Campus administrators and facilities managers are continually faced with the economic dilemma of low first costs or low operating costs. Life-cycle cost analysis has become the common tool to address these decisions. Life-cycle costs consider all the costs of owning the specific utility assets rather than just first cost. However, this is only a starting point for analysis. Comprehensive capital asset management strategies not only include first cost, but also must be extended to include financing cost, energy cost, maintenance cost, replacement cost, and salvage value. Alternative capital investments can be compared on a net present value basis, through explicit discounting of future costs to reflect a time preference for financial resources in the near term. The utility development plan must be a persuasive business plan. Central plant systems tend to have higher first costs. Central plants are designed for long life and centralized maintenance, and the cost of hookup of new systems is usually low. Local site solutions, such as unitary or rooftop equipment, usually have lower first cost but higher operation cost. Any plan, to be useful, must be followed. The phrase "staying the course" generally indicates that a plan, once begun, must be followed to determine whether it is successful. A good master plan must be followed to ultimately succeed. Two components are critical to implementing a long-term utility master plan. First — and probably most important — is that the plan also be adopted as a business plan for utility services by the business officers of the university. Without this support and commitment, even the best utility master plan is likely to be 'shelved' in favor of other fiscal priorities. Second, there must be interim testing of the plan’s integrity and accuracy throughout the relevant planning period. A utility master plan is a guide to changing future requirements. As such, it must be understood to be a dynamic guide to the future provision of utility service requirements. Considerable effort, thought, and expense go into a campus utility master plan. That kind of thought is not possible with each new building or potential option. Managers should not throw out all of that work for what may seem to be a better idea during the heat of discussion in a meeting. Even more important, they should refer to the plan often and use it to prevent others from causing a change in course. Such changes in course are likely to be costly in the long run. When a truly good opportunity does come along, managers should carefully consider it and revise the master plan as discussed below rather than abandon it, as such the plan needs to be continuously updated on a regular schedule to adapt to change in technologies. The most common attempt to deviate from the utility master plan usually consists of pressure to accept systems with lower first cost. Budgeting is always tight, and it is easy for building users to be more interested in getting space and program equipment than in reducing life-cycle operating costs. After all, they consider it someone else's problem. Managers should use the utility master plan to show the advantage of the lower life-cycle cost approach. No plan can anticipate every possible new requirement or opportunity. Each deviation from the adopted master plan must be subjected to careful, complete evaluation. A procedure for evaluation of deviations should be adopted and enforced. A good utility master plan must be a dynamic document that keeps current with campus growth, conditions, and other factors that affect the plan. Indeed, information technology (e.g., advanced, distributed metering) is probably the biggest single shift in the ability to optimize utility planning over future periods. The plan should be updated every three to five years, depending on the rate of growth of the campus. In addition, certain events should trigger plan update or review. Some of the events are discussed here. Changes in facility development plans are inevitable. Changes in campus expansion plans should be reflected in the utility master plan as an update. If the changes are major (e.g., a change in the direction of expansion, or major renovations rather than new construction), a complete revision of the utility master plan may be warranted. The effects of new buildings should be analyzed by individual computer models integrated into a master campus model. This will give the best estimate of the impact of a new building on the central plant. The energy-related costs of the new building can also be estimated with good accuracy. Utility consumption, utility costs, and operational costs for utility systems should be tracked monthly. The costs and trends should be compared with the projections from the utility master plan. This information will point out potential problems if the energy use deviates markedly from the plan. Sharp changes will be definite indicators of either potential problems or expected changes because of the addition of a new building or a new system. The energy and cost records will also form an excellent basis for upgrading the campus utility master plan. There is nothing like experience and real data to help increase the accuracy of predictions. If a dynamic computer simulation model of the utility systems is developed through the master planning process, there must also be recognition of the limitations of such resources. In particular, such a model is unlikely to accurately predict short-term fluctuations and anomalies and should be (re)evaluated with sufficient frequency to allow understanding of the source(s) of major deviations from the plan. Major changes in the use or cost of energy should trigger review of the utility master plan. New boilers, new chillers, or new distribution systems should trigger examination of the utility master plan to determine whether their impact will change some of the recommendations in the master plan. If the changes are a result of recommendations in the master plan, then changes in the master plan should not be necessary. Any major change in the energy system, however, should be cause to review the plan, if only to ensure that everything is on track. Energy costs fluctuated with various developments, such as the worldwide political situation, weather, and factors affecting competition. It seems inevitable that energy costs will increase again at some time in the future. The utility master plan should allow for this possibility; however, future changes may take unexpected or drastic turns. If this is the case, the utility master plan should be modified to respond to the challenge. This section presents an outline of a utility master plan. This outline will not cover the needs of every master plan, nor can every institution adhere to the organization suggested. Nevertheless, this outline can serve as a starting point and as a checklist to see that the plan incorporates the needed sections. This chapter summarizes the utility master plan. It is typically a few pages long and is intended to present the findings of the study for administrators who lack the time for a detailed reading of the master plan. The executive summary should also provide information on the specific chapters where more detailed information on the findings can be examined. Often, tables are used to summarize key information. This chapter presents information on the institution, the conditions at the time of the study, and the intentions and scope of the master plan effort. Typically, credit is given to those who have participated in the master plan effort. This chapter should also cite the other documents that were used in the preparation of the master plan (e.g., previous reports, studies, and the academic and/or facilities master plan) and should be dated with the month, day, and year the plan was finalized. This chapter presents information on the existing utility systems, including when the systems were built, the system capacity, the condition of the systems, and the loads currently served. Plans should be included to show general routing and the capacity of systems in a graphic way. Typically, this section also includes information on utility use and costs. Examples include the kilowatt demand, kilowatt-hour use, and cost of electrical energy by month. Similar records for gas, oil, and/or other fuels; water; and sewerage are typically included. It is useful to develop a campus grid map with the amount of loads in each grid identified. This approach is helpful in quickly identifying where the major loads served are located. This chapter should also include the known factors that affect the expected life of the systems. Systems that need replacement or repairs to meet code or changing conditions (e.g., the chlorofluorocarbon phase-out, new air quality requirements, or new air emissions requirements) should be identified. This chapter presents information on the expected growth of the institution and the impact of that growth on the utility systems. For example, the chapter may have tables listing expected new buildings, expected square footage, the amount of load expected to be added with the buildings, and the year the new buildings are expected. When a grid of the campus loads is developed, the location of the expected expansion should be shown on the grid and the developed loads identified. Tables that show the expected total capacity needs along with the capacity available on a year-to-year basis help establish the needed utility expansion and the time when such expansion is needed. This chapter looks at alternatives considered in meeting the continued needs of the institution. This includes needs involving services to the existing institution, in addition to expansion needs. For example, a deteriorated campus electrical supply may be repaired, replaced, or sold to the utility. Another alternative may be to purchase the delivery system or perhaps the primary service transformers from the utility. Other alternatives may include total energy approaches, in which the institution provides all of its electrical service. This chapter identifies the alternatives examined, presents the advantages and disadvantages of each, and delineates the costs for competing solutions. Typically, sketches are included to explain the alternative locations where utilities are to be installed. In this chapter, solutions are recommended from the competing solutions presented in Chapter 4. Typically, this is the solution with the best life-cycle cost, but other factors may determine that the solution with the best life-cycle cost is not recommended. Chapter 6 develops a list of recommendations, cost estimates for all of the recommendations, and timetables for implementation. The appendix to the report should include information such as utility use records, utility rates, costs estimates, life-cycle cost calculations, and the other information used as a basis for the master plan. Tables of takeoff information and a summary of system capacities that were determined during the process of master planning should be included. Where appropriate, manufacturer information used in preparing the study is included (e.g., pipe information or chiller or boiler cut sheets). Where quotations from vendors are key to the master plan, the actual quotation should be included as appendix material. In short, whatever information is needed to form a solid background that allows others to accurately evaluate the master plan and its recommendations should be included.